Charakter - Droide. Punkte: 8. Ausdauer: 8. 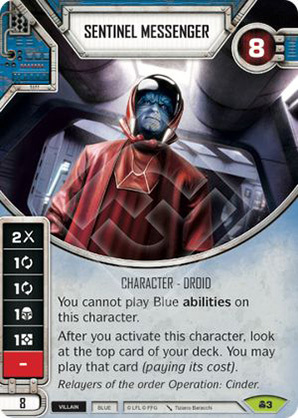 You cannot play Blue abilities on this character. After you activate this character, look at the top card of your deck. You may play that card (paying its cost). Relayer of the order Operation: Cinder.